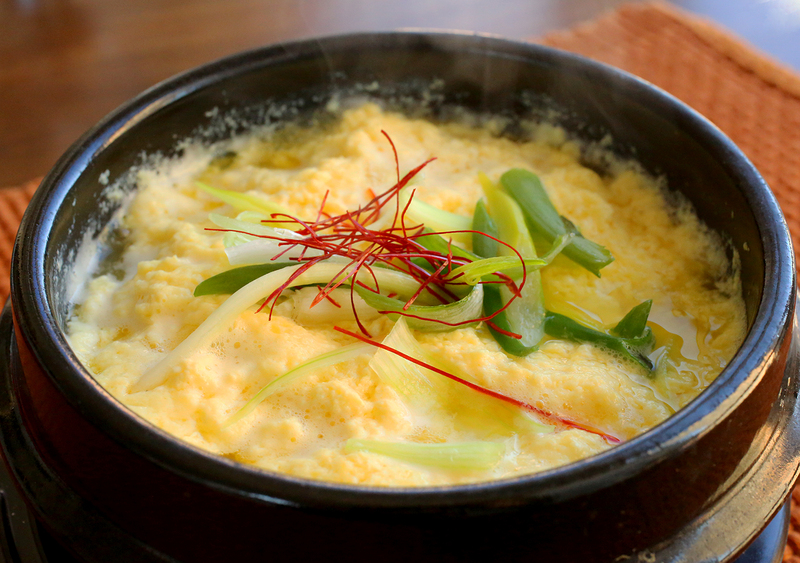 Steamed egg cooked in an earthenware bowl is called ttukbaegi gyeranjjim because ttukbaegi means “earthenware bowl” in English and gyeranjjim means “steamed egg mixture.” The good thing about this dish is that you can serve it like stew or soup, it’s delicious either way. I posted my gyeranjjim recipe a few years ago but I used my microwave oven instead a stove. Enjoy fluffy hot ttukbaegi gyeranjjim! Eggs, chicken broth, fish sauce, green onion, sesame oil. Add 1½ cups of chicken broth to a 3 cup earthenware bowl. Boil over medium high heat. 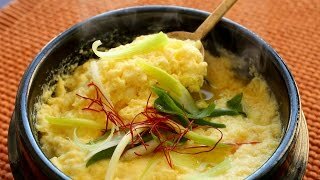 Add 3 cracked eggs and 1 egg yolk to a bowl. Add 1 ts fish sauce and 2 tbs chopped green onion to the eggs. Beat well. When the chicken broth starts boiling, lower the heat to a simmer. Add the egg mixture to the simmering broth and stir it well with a fork well for 10 seconds. Close the lid and simmer another 4-5 minutes until the egg mixture sizzles and has a texture like soft tofu. Open the lid and turn off the heat. Drizzle 2 ts sesame oil and sprinkle 1 tbs chopped green onion over top. Serve hot as a side dish with rice. Posted on Monday, November 14th, 2011 at 2:03 pm. Last updated on January 5, 2015. Posted October 13th, 2017 at 12:27 am | Log in to reply. I was craving a midnight snack that would not break my diet. This was quick yummy and filling. So tasty and crazy easy. Thank you! This recipe was originally posted on November 14, 2011 at 2:03 pm by Maangchi. It was last updated on January 5, 2015. The video was watched 1,111,543 times on YouTube & has 11,506 likes!